While children in Japan often start learning the basics of origami as preschoolers, most people in the United States feel you will have better luck if you wait until your child is between six and eight years old. Children need to be able to sit still, follow directions, and focus on a task in order to be successful at origami. A basic understanding of fractions is also helpful, but you can provide assistance in this area if needed. Young children are notorious for their short attention spans, so it's a good idea to choose a model with as few steps as possible. A simple origami project with five to 10 steps is ideal for a child who is just learning the basics of paper folding. Try to pick a model that can be completed in 15 to 20 minutes. Choose a model that appeals to a child's interests; swords, boats, farm animals, flowers, butterflies, boxes, notebooks, and origami crowns are good options for any child. Always take the time to practice folding an origami model on your own before you attempt to teach the steps to a child. Even if the instructions look basic, you might find that there is a part of the project you don't understand or a section that is more difficult than it first appears. You don't want to stop the lesson to figure out the directions. If you're teaching a large group of children, it may be helpful to fold demonstration versions of each step in your model. If a child is having trouble, he or she can look at each model in succession to help identify where the problem lies. When teaching origami to a child, don't expect the first model to be perfect. Even adult paper folders often need to try making the same project three or four times in order to get each step completed correctly. Make sure you have plenty of paper available for practicing. If you don't have enough origami paper, lightweight computer paper cut into squares makes a good substitute. Newspaper or wrapping paper will work as well. If the child is getting frustrated by the project, provide gentle assistance. Don't criticize folds that are slightly off. Provide praise for effort, even if the results aren't entirely perfect. Stress that origami experts hone their skills through many years of practice. Many simple origami projects are somewhat abstract, which makes them hard for a child to visualize. Even though you may be able to see how the folds form a cat's head or a frog's body, your young students might not be able to make the connection. Adding details such as google eyes to a completed origami model can increase your child's interest in learning more about paper folding. There are also origami kits for children that feature paper that is patterned to result in a model with a more realistic appearance. 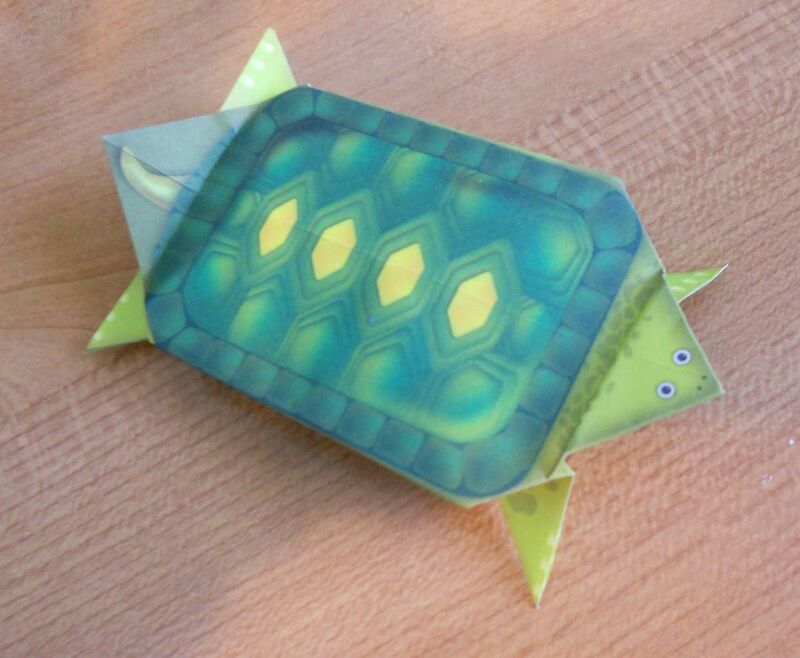 For example, the origami sea turtle in the photo accompanying this article was folded using paper from a kit purchased at a Dollar Tree store.